Our Custom Wood Countertops Blog features the industry’s most talented and innovative designers throughout the United States and abroad. This featured kitchen includes a Wenge and Cherry Checkerboard Butcher Block designed by Andy Foster of Foster Custom Kitchens. 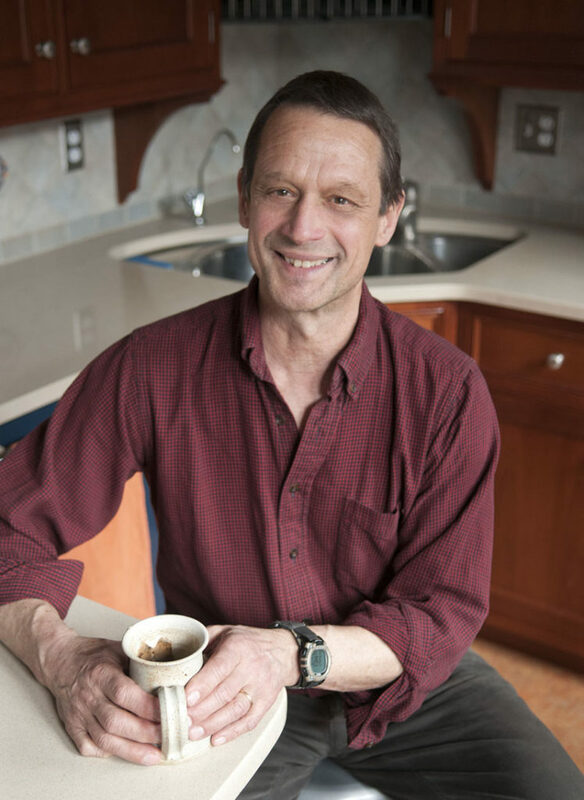 About the Designer: Andy Foster, an accomplished kitchen and bath designer, has been a cabinetmaker for over 40 years. He began woodworking as a hobby shortly after college, and it soon became a passion and a profession. 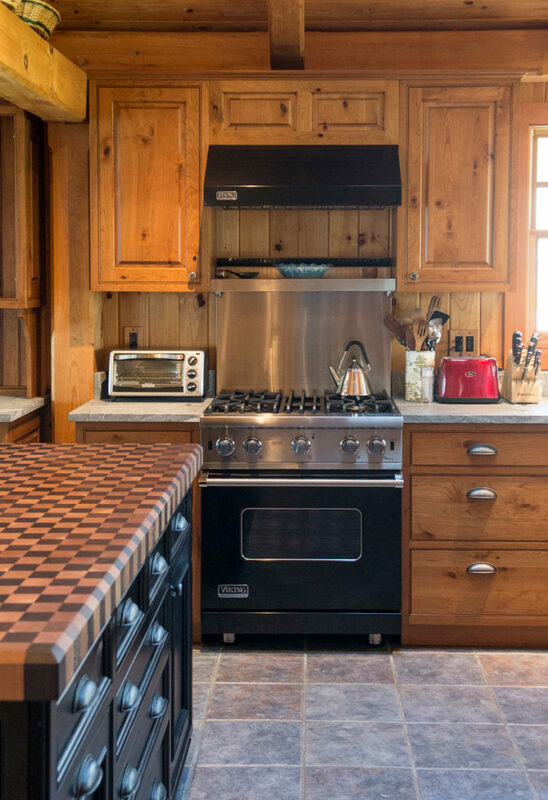 In 1987, after over a decade of commercial woodworking in several venues, he founded Foster Custom Kitchens. What stands out about Andy is his knowledge of and experience in all phases of project development, including design, fabrication, installation, giving him a unique perspective of the process involved in creating a new or remodeled space. A Tip from Andy: The downstairs of this home has Douglas fir walls, ceilings and beams. 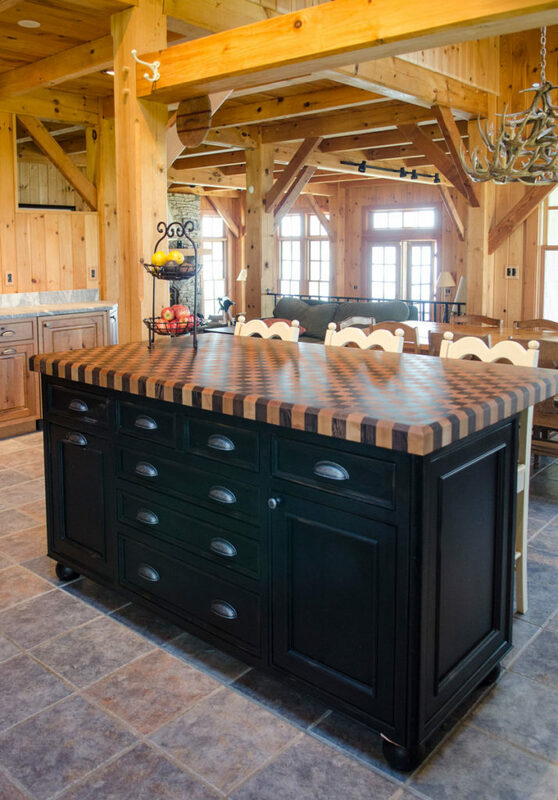 The owners chose beautiful rustic cherry for the surrounding cabinetry, and wanted a wooden countertop for their distressed, black, painted cherry island. We were concerned that adding a planked wood grain to the mix would be a little over the top. 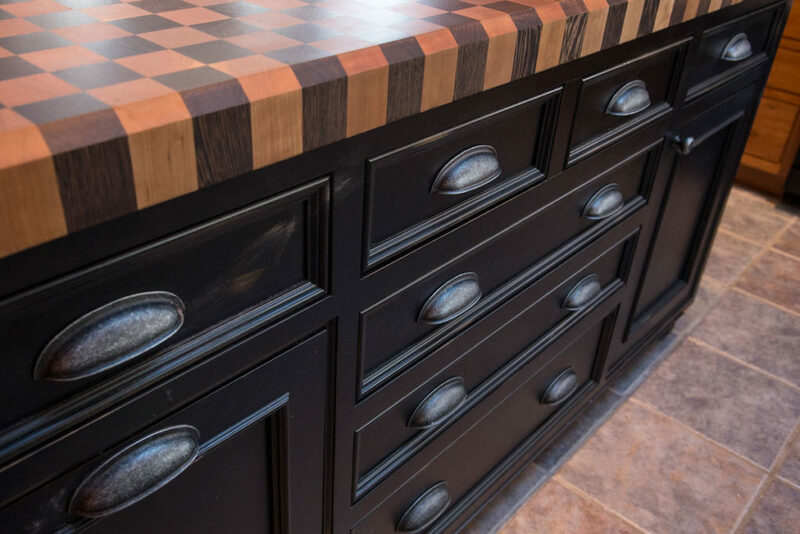 Choosing a contrasting, end-grain checkerboard pattern of Wenge and Cherry made the island “pop” and tied the painted and natural woods together. 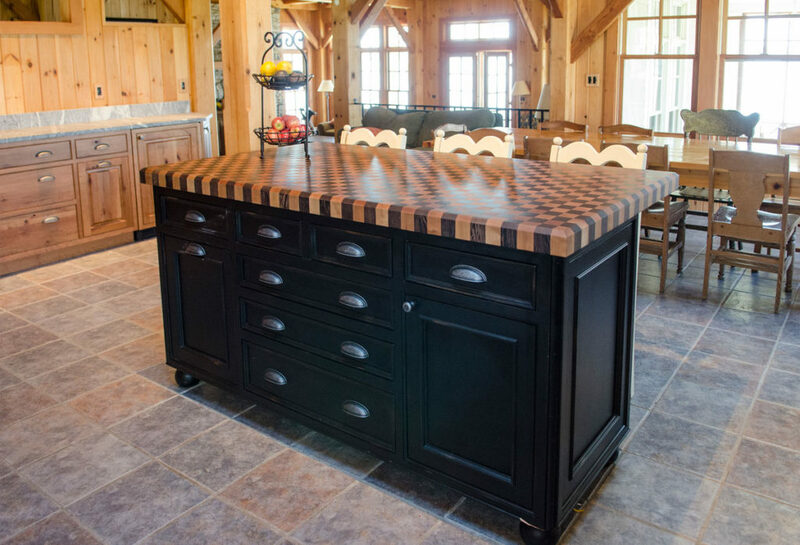 Cabinet Manufacturer: Kitchen Island by Foster Custom Woodworks. Surrounding cabinetry by Kountry Kraft. View additional designs by Foster Custom Kitchens on their website, Facebook, and Houzz. 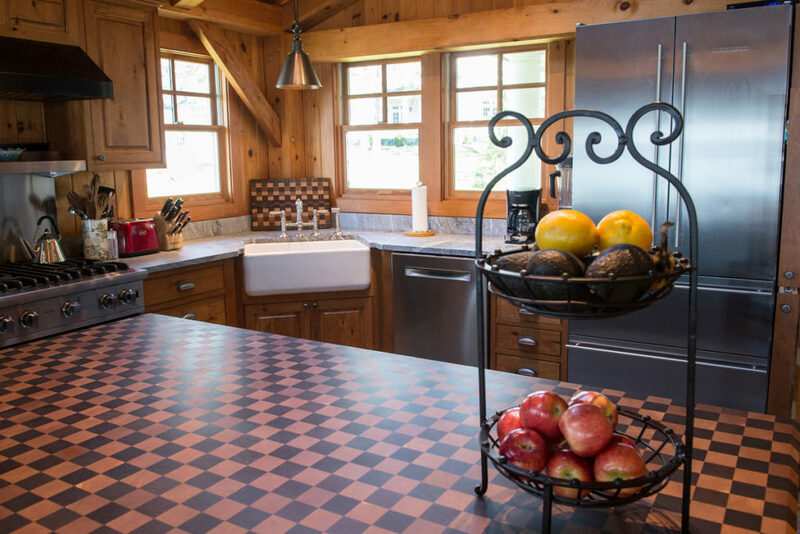 Other kitchen designs including a Checkerboard Butcher Block can be seen on the Grothouse Countertop Image Library. See the latest Grothouse news and announcements by liking our Facebook page. This entry was posted in Butcher Block Countertops, Butcher Blocks, Butcherblock Countertops, custom wood countertops and tagged Butcher Block Countertops, Butcherblock Countertops, butcherblock islands, butcherblock kitchen countertops, custom wood countertops, kitchen island by Denise Grothouse. Bookmark the permalink.